President’s Message— IMPORTANT!!! Our next general meeting is on Oct 21, not Oct 28 - Highlight Oct. 21 as the date for our next general meeting, not Oct. 28 as mentioned in some earlier communication. The meeting starts at 6:00 pm. Come and bring a dish to share at the potluck. Invite a guest and introduce them around. Plans for our Second Annual Soup Night are on schedule and tickets are going fast. Our Soup Nights are to raise money for a permanent History Center. See the Soup Night article further on for additional information. The Fair Oaks Rotary Club is working with us to design a portable exhibit we could use with local schools as well as at the History Center. This joint project is funded by the Rotary Club and is aimed at getting kids thinking about history and preserving the heritage of Fair Oaks. We will elect officers for 2009 at the general meeting on Oct. 21. The Nominating Committee will announce their slate of officers and additional names can be nominated from the floor. Serve as a Docent at the History Center on a Sunday afternoon? Recommend historical topics for programs at the general meeting? Serve as a Greeter at one of our general meetings? Tell us if you or someone you know has experience in writing requests for grants; to help get money for History Center renovations? Volunteer to work on one of the committees or projects, such as Soup Night, or the Portable History Exhibit? Tickets for our Second Annual Soup Night, November 7th from 5:30 to 8:30 pm, are on sale and going fast. Buy your tickets from Soup Night Committee members before or at the General Meeting on October 21; we are not selling tickets at the door this year. Tickets are $25 for adults and $10 for children. Most of the soup bowls this year will be hand painted by members of the Historical Society with assistance from Michelle Lueth, Ceramics Instructor with the Fair Oaks Recreation and Park District. The bowls are painted before they are baked in kilns. We need your help with the painting on Friday Oct. 17th and Saturday Oct. 18th from 10 am to 1 pm. Please come and paint a bowl or two. Call Lynn Steen at 967- 7135 for more information. We also need additional items for the auction and raffle. Please continue to solicit contributions from friends and businesses. Letters of solicitation to be used in making requests are available from Claudia Thorn (961-8291) or Lynn Steen (967-7135). In addition, we will be contacting members to help on Friday November 7. Help is needed starting about 9:00 am, making soup, setting up and decorating the Clubhouse, as well as serving and cleaning up. Please be generous with you time when you are called. Remember that Soup Nights are to raise money for the “Building Fund” for our permanent History Center. Gaynel Wald from the Folsom Historical Society will be performing a living history of Nancy Kelsey. Nancy Kelsey was the first white woman to cross the plains to California in the spring of 1841. She is known as the Betsy Ross of California. Gaynel will come to our quarterly meeting on October 21, 2008 dressed as Nancy Kelsey to tell her story using a number of visual aides. Come see the living history of a woman who was a great pioneer. I would like to take this opportunity to thank members of Bella Vista High School’s first graduating class for their slide presentation of Bella Vista High School then and now. Speakers from the first graduating class of 1963 were Nancy Ainsworth (a song leader). Jon Esparza (member of the student body and school football hero), with a letter from Tamara Wood (student body president). They shared with us what it was like to be at a new school in 1961 and responsible for setting up the student government, choosing the school colors, mascot, and writing the school’s fight song. It was such a great opportunity for them to learn about government first hand while setting up the student government at a new school. They were very instrumental in making Bella Vista the great school it is today. Other students representing BV in the 1960’s were Mary Ickes-Oliver, Cyndy Schiltz-Mason, Dorthy Alley-Irwin, Kathy Rander, and Sherry Lynn Wood. 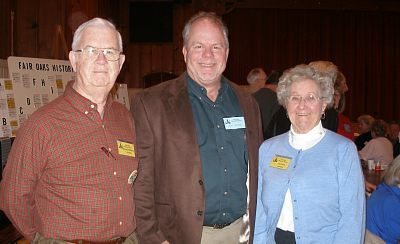 Their 45th class reunion was held On September 6, 2008 in the Fair Oaks Community Club House, and was a great success. Tentative Programs for 2008: January’s program will be a potpourri from members of the Fair Oaks Historical Society. We received a call from "Farmer Bob" Massey regarding the location of the Downing-Radke home that we featured in our last newsletter. It burned in 1936. We had placed it near Fair Oaks Blvd. and Sunset based on the 1930 census. "Not so" said Bob. It was on Hazel Ave. across from the Phoenix Olive Plant. He knows because he was a volunteer in the Fair Oaks Fire Department and responded to the fire "with a bucket of water and a burlap sack." Can't argue with that! Thanks for the correction Bob. Fair Oaks Historical Society General Meeting Minutes, July 22, 2008. The meeting was called to order by President Ken Steen, following another great Potluck. The guests were introduced. Pete White’s Historical Moment: Pete talked about the Community Clubhouse before Aerojet. Program: Sherry Wood introduced the Program, recollections of the first years at Bella Vista High School. 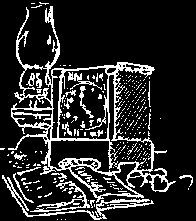 Minutes: The minutes were approved as published in the Newsletter. 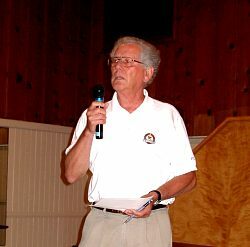 Treasurer’s Report: Joe Dobrowolski reported that since the April meeting we have had in come of $1292 from new/renewal memberships, raffle, wine, royalties and memorials. Past President’s Report: Warren McWilliams related that there will be no movement until a new superintendent for the school district has been named. Kitchen Committee: Warren and Judy Blomquist announced that we had about 100 in attendance tonight. Ways and Means: Marilyn Dupray reported that tonight we brought in $173 in raffle tickets and $43 in wine donations. Membership & Registration: Ken reported that Bob Barrett has resigned the membership position, please contact him if interested. History Center: Lois Frazier announced that there were about 150 people in attendance at the Memorial Day Program. Thanks for all the cookies, they were much appreciated. the July opening of the Center had about 15 attendees. Articles donated by Carl Reese (retired fireman) were on display. Jim Ezell showed each of the items. 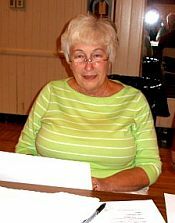 Newsletter: Marilyn Pearce reported that Jane Whitlock will help with the house articles. Publicity: Trude Vasquez reported that she has been putting Soup Night articles asking for donations, she asked if anyone knows of other places she could publicize or organization, let her know. 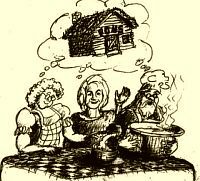 Soup Dinner: Lynn Steen and Claudia Thorn reported that there would be a committee meeting in the next couple of weeks. They would appreciate receiving auction items as soon as possible. More information in the next Newsletter. Nominating Committee: Warren McWilliams, Meg Smart, and Trude Vasquez were nominated. June Melvin moved that the nominations be closed. Motion seconded. Motion passed. Ken asked that we will need volunteers to work on grants for refurbishing the Old Library Building, please contact him. As a result of our good newspaper coverage for our 2nd Sunday Open House, we average 5 to 15 visitors at the History Center. A new page has been added to the Memorial Book. Donations have been received in memory of Bessie Drobny-1908-2008. On September 12th, a group from the Citrus Heights History and Arts Commission toured the history center. Pictured (l to r) are Warren, Lois, Ken, Jim, Debra Kessler, Chuck Engvall, Thomas Spencer behind Janet, Janet Ruggiero, Wilma Camilleri, Nicole Piva and Teena Stern. The history center was open to visitors on Saturday, September 20 for the Chicken Festival during the hours of the Grange Breakfast in the Community Club House. 24 people signed the Guest Book and many more also visited. Our Christmas Open House at the History Center will be on Dec. 14 from 1:00 to 4:00 pm. 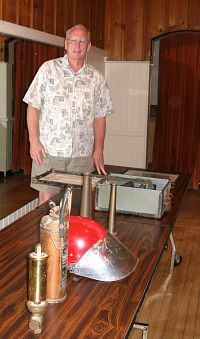 The new acquisition of early Fair Oaks Fire Department artifacts will be on display. Hot cider, punch and cookies will be served. Thanks to the following people for being docents; Betty Anne McArthur, Meg & Larry Smart, Evelyn Heim, Lois Frazier, Diana Lennon, Gordon & JoAn Heidt, Fran Sargent, Ken & Lynn Steen, Jim & Marilyn Pearce. Thank you. Officer nominations for 2009 - In accordance with the bylaws, the nominating committee has identified the following slate of nominees. Other individuals may be nominated from the floor before we vote at the October General Meeting. Secretary - Janet McWilliams, Treasurer - Joe Dobrowolski. It was with great regret that we noticed the headline in the Sacramento Bee, Thursday, October 2, "It's end of the line for region editions." This is the section where we advertised our meetings and events. It remains to be seen whether the Bee will continue to cover our activities in other sections of the paper. Of particular concern was the note in Bob Walter's column, "Adios, maybe:..... The Bee's regional sections are going away and so is this column..." Bob has been a good friend of the Fair Oaks Historical Society and has always given us a plug in his column. We hope to see him regularly at the "best potluck in the town!." This charming, older home originally had an address on Magnolia Ave. The home had a u-shaped front driveway, lined with palm trees that now encircle the perimeter of the spacious backyard. The front door now faces Orangewood Dr., which was once the back of the home. A former resident says that Dr. Joseph H. Buffum built the home for his daughter when she married. His mansion was across the street. In 1941, the Arthur White family (Pete's dad) purchased the 2-story home and 2-story barn situated on 15 acres. There were 10 acres of olive trees, 5 acres of orange trees as well as 3 or 4 noisy peacocks. The address was Rural Route 123 and the phone # was Fair Oaks 123. 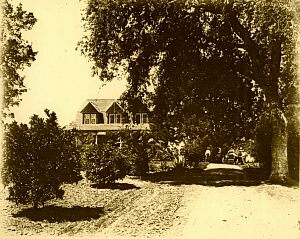 The home was called "Red Top House" or the "Hill Top House" because it was built on the highest elevation on Magnolia Ave. The home presently has 3 bedrooms upstairs and a playroom. Downstairs there are 3 bedrooms, 2 baths, a formal dining room and living room plus a den/family room. In older times it had a screened wrap-around porch. It has a full concrete basement. When Aerojet Corporation caused property values to increase, Mr. White subdivided the 15 acres. The home was sold and new owners did some remodeling in 1975. The house then fell into disrepair. A Mr. McCarter did renovations to the house in the mid-90's. 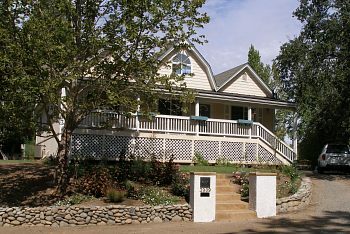 The home was purchased by the Hughes in 1996 who are in the process of restoring the home and grounds. They have already made many improvements including the addition of a landscaped pool area . It is a pleasure to see a young and growing family enjoy their home. If you have more/correct information on the "Hill Top House," please contact Jim or Marilyn Pearce. Credit goes to Jane Whitnack and Pete White for writing this article.